September 25, 2016, marks exactly four decades since Bono, The Edge, Adam Clayton, and a handful of others jammed in Larry Mullen Jr’s kitchen. Those four names would eventually become the members of U2. Let’s take a look at the most important moments in the band’s history to date. 1. 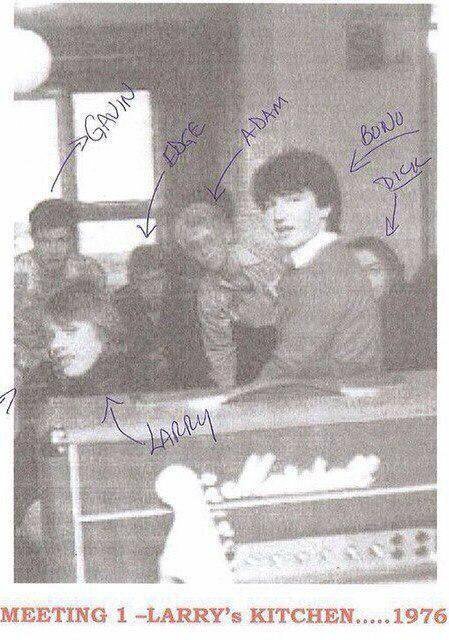 Larry’s note on the noticeboard at Mount Temple Comprehensive School. Incredible to believe that without that note, there would be no U2. If that bit of paper still exists, what would it be worth? 2. The first jam session in Larry’s kitchen. It was chaotic, with not even one song completed, but there was a spark. 3. The first ‘gig’ was at Mount Temple on a stage that comprised a bunch of tables pushed together. Peter Frampton’s Show Me the Way was one of the songs of choice. 4. The band members’ parents kick in 500 pounds each so U2 can travel to London in the hope of getting a record deal. Unfortunately, it doesn’t come to fruition. 5. Winning a Harp Lager talent contest in Limerick. The band use the 500 pound prize money for a photo shoot and to buy clothes from a punk clothing shop. 6. The death of Bono’s mother, Iris Hewson (nee Rankin). While no more important than any of the band members’ parents, Iris is the inspiration behind several U2 tracks including I Will Follow, Tomorrow, Lemon, Mofo, and Iris (Hold Me Close). 7. Meeting Steve Averill, who came up with the name U2. 8. Meeting Paul McGuinness. He was instrumental in the off-stage success of the band. One of the most interesting facts about McGuiness is that in the early days, he would deliberately book U2 to play venues that were too small. It ensured the billboards always said the U2 gig was sold out, but it also meant some fans missed out. This created a frenzy where those who didn’t want to miss out would queue for hours just to get a ticket. 9. 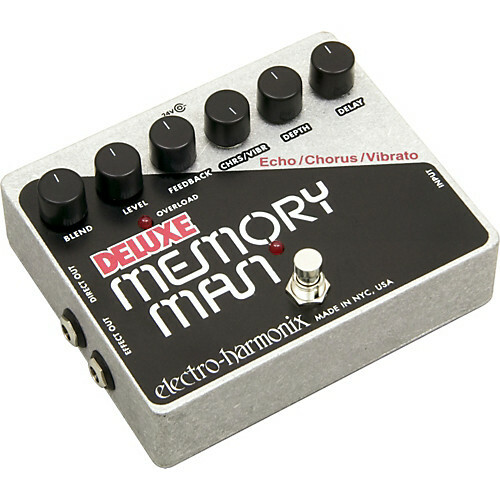 The Edge buys the Memory Man effects pedal for his guitar, which gives U2 its signature sound. 10. U2 release their first official recording, an EP called U23 which includes the tracks Out of Control, Stories for Boys and Boy/Girl. 11. February 26, 1980 – Island Records sign U2 after a show at the 2400 seat National Stadium in Dublin. The choice of venue was a risky move, considering U2 had returned empty-handed from a record deal-seeking trip to London. Island Records A&R man Nick (Bill) Stewart is at the show and gives a verbal agreement they will be signed. The band sign the contract in the women’s toilet at the Lyceum Ballroom in London months later. 12. Violence became an integral aspect to the spirit of U2. The Troubles were the subject of many songs, the most famous Sunday Bloody Sunday. All the carnage made U2 question why lives had to be lost over political ideals, propagating the compassionate side of the band which is still very much alive today. 13. Bono, The Edge and Larry Mullen Jr decide to steer away from Shalom, a Christian group, and give their full attention to U2, much to the relief of McGuinness and Adam. 14. War is the first U2 album to hit No1 on the UK charts. 15. U2 put all their savings (about $30,000) on the line to film a gig at Red Rocks in Denver, Colorado. Torrential rain does its best to end the gig before it begins, but the band hit the stage and put on a show to remember. The Under a Blood Red Sky concert video becomes an instant success. 16. Meeting Willie Williams, stage designer who has worked with the band since the War Tour in 1993. Williams eventually becomes instrumental in placing U2 at the very top of innovation when it comes to live shows, be it in arenas or stadiums. 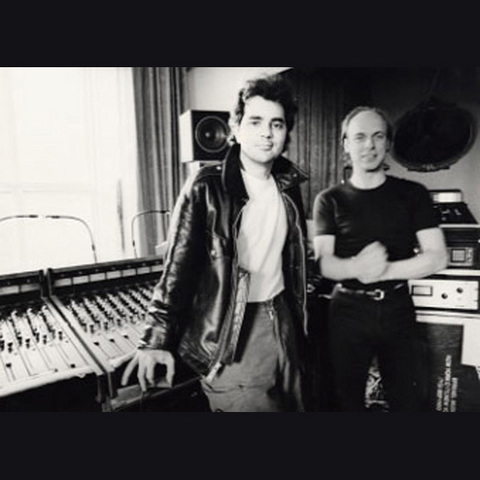 Producers Daniel Lanois and Brian Eno. 17. Bono talks Brian Eno into producing the next album. Eno comes to the discussion with Daniel Lanois, and they decide to give it a shot. They set up shop at Slane Castle, recording songs that eventually end up on The Unforgettable Fire, the bands most experimental album to date. 18. McGuinness and Island Records renegotiate the band’s contract. With other labels circling, the two camps come to an agreement that gives U2 copyright ownership of their songs, extending the record deal and increasing royalties. 19. U2 make the cover of Time magazine accompanied by the now infamous headline “Rock’s hottest ticket”. It gives the band a weight that others could only dream of achieving, but also places huge responsibilities on their shoulders. 20. Bono travels to Africa with his wife Alison Stewart to get an idea of the problems faced by the continent’s poor. The trip fuels Bono’s activism and Africa becomes a focal point, which is still the case today. 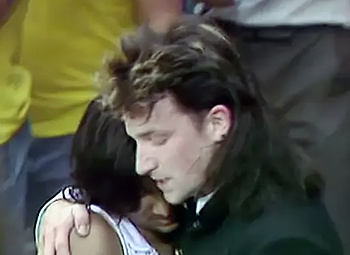 Bono steals hearts at Live Aid. 21. Live Aid. If Freddie Mercury stole the show, U2 stole all the hearts. Bono’s desperation to make contact with the crowd was seen as a huge mistake by the band, but the billions watching it on TV thought it was the poignant crescendo of what was an incredibly moving day. 22. The Joshua Tree is released and immediately rises to No.1 on the charts around the world. The album makes U2 a household name. Within 11 years, the band who could hardly play an instrument in Larry’s kitchen reaches the pinnacle. 23. The Joshua Tree is the first U2 album to hit No.1 on the US charts. 24. U2 win the first of of their 22 Grammys in 1988 and now hold the record for most Grammys of any group. Their last win was in 2006. 25. With or Without You is the first U2 single to hit No.1 on the US charts. 26. Desire is the first U2 single to hit No.1 on the UK charts. 28. Work on the next album sees an unprecedented amount of friction in the band. While wanting to take a new musical direction, the ideas just aren’t flowing as expected. U2 find themselves in Berlin’s Hansa Studios, hoping the ghosts of David Bowie’s Heroes album will wash over them, but it’s just not happening. Serious questions are being asked about what the future holds, and whether it might be best to split up. A series of chord progressions suddenly arrive, chords that would eventually become the song One. U2 have stepped back from the precipice, turned around, and begun their most creative ascent. 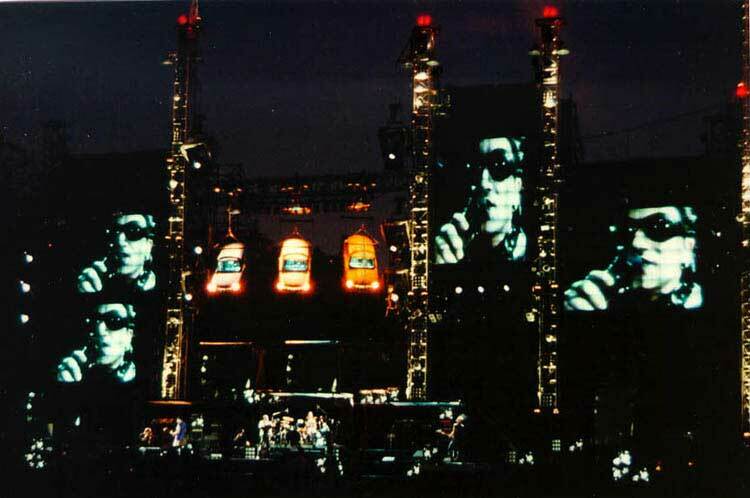 At the peak lies the album Achtung Baby, which is released to global acclaim. The sensory overload of Zoo TV. 29. U2 embarks on the Zoo TV tour in support of the album. The first shows are in arenas, with TV screens and Trabant cars scattered across and above the stage. But Zoo TV is at its best in stadiums, where the world’s biggest rock stage at that point becomes a mind-blowing experience for the hundreds of the thousands of fans scrambling for a ticket. The tour becomes the benchmark for the industry, and U2 proves it can reinvent its sound, its image and maintain its success. 30. Bassist Adam Clayton misses a gig for the first time. The first of two nights in Sydney on the Zoomerang Tour of 1993, Adam doesn’t make it to the gig after a bender. His bass technician Stuart Morgan steps in to take Adam’s place. The event, the first time any of the four members has missed a show, puts great pressure on the U2 organisation as the following night’s concert will be filmed for posterity as the tour DVD and being beamed live in the US. Adam vows to give up alcohol, returns on the second night, and has never looked back. 31. The band plays a Popmart Tour show in Sarajevo, with Bosnians regarding the concert the official end to the siege of their battered city. 32. Reapplying for the job of best band in the world, U2 releases All That You Can’t Leave Behind, widely regarded a return to form. Congratulations, you’ve got the job guys. 33. 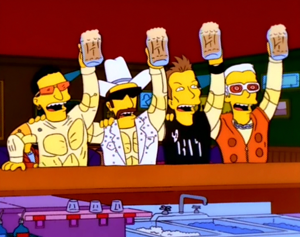 U2 appear on The Simpsons during an episode titled Trash of the Titans (22nd episode of the 9th season, also the show’s 200th episode). 34. U2 perfom what is widely regarded the best ever Super Bowl performance in 2002, just months after the September 11 attacks in New York. They give the occasion the dignity it deserves, displaying the names of all the victims rising to the heavens above a heart-shaped stage. 35. U2 sign a 12-year deal with Live Nation worth $100 million, giving Live Nation control over the band’s merchandise, sponsoring and web site. 36. The 360 Tour becomes the highest grossing tour in history. It rakes in $750 million and is seen by more than 7 million people. 37. U2 live stream a full concert from the Rose Bowl, LA, through You Tube, believed to be the first time a concert is streamed live through the social media service. 38. Paul McGuinness steps down as U2 manager, handing the reins over to Guy Oseary. 39. U2 releases Songs of Innocence free into 500 million iTunes accounts, with Apple reportedly paying the band $100 million. Despite widespread criticism, the album is heard by tens of millions of people and is likely to pave the way for other artists to develop innovative ways of releasing their songs. 40. The band postpone four shows after finding themselves in Paris during a terrorist attack. U2 performs powerful, emotional shows when they return to the city following the loss of 130 lives.